Yesterday I introduced the snake as a subject in art. Here’s an example of a sinister serpent / person in Hindu tradition. Aghasura was a demon follower of the evil (pseudo-demon) king Kamsa (of Mathura), who was Krsna’s uncle (brother of his mother Devaki). He tried many times to kill Krsna because of a prophecy that one of his sister’s eight children would kill him (which Krsna eventually did). 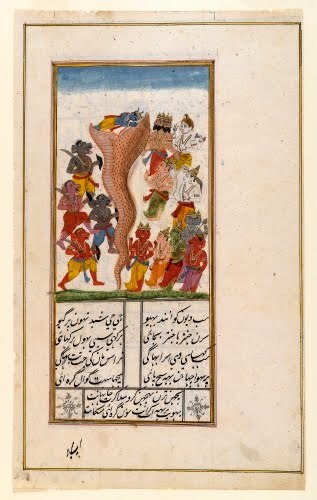 The demon Aghasura made himself into an eight-mile-long serpent with a mouth disguised as a cave entrance into a mountain to lure Krsna to his death. When Krsna’s friends, young cowherders, went in the mouth and risked death, Krsna saved them and killed the demon serpent. The Deccan Sultanates were a group of five independent kingdoms in southern, central India that flourished starting in the late Medieval Period (600–1200 CE). As with the Mughals in the north, the Deccan sultanates established a rich legacy of art, architecture, and literature. The Deccan region had contacts with Persia and Arabia since ancient times. It first became part of the Islamic Indian world when the Delhi Sultanate first undertook expeditions against the Deccan Kingdoms and ultimately incorporated them into the Delhi Sultanate. Much of the population of the Delhi court was moved there to Deogiri as the secondary capital in 1328. Between 1574 and 1636, the Mughal Empire gradually gained control of the Deccan and annexed the sultanate. Even before annexation by the Mughal Empire, Deccan painting was heavily influenced by Persian art. Like the Persian artists who were brought into the Mughal court, Deccan painters absorbed influence from Western art that they saw, particularly manuscript illumination executed in a format that resembled book illustration. Although this page indicates the influence of Western manuscript format, the vertically arranged demons (left), serpent demon (center), and demigods cheering on Krsna (right) are arranged in vertical perspective, a traditional Deccan painting device. The series continues tomorrow with a look at snakes in modern design.